How to describe Halloween in Chicago during the 1920s? Two words: property damage! Who was responsible for all the fire, damage, and near-death experiences? Halloween has gone through a number of transformations since it originally came across the pond with English, Irish and Scottish immigrants to America. 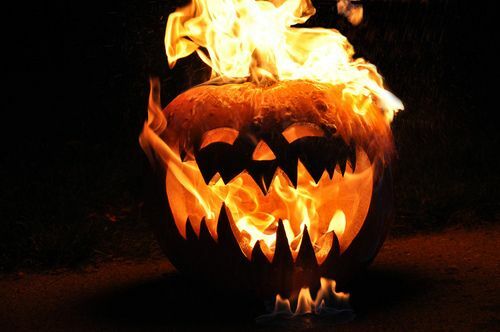 In the early days of the United States, it had started off as something similar to its English cousin: a harvest celebration aimed at adults, with an emphasis on fortune-telling, superstitions, burning harvest refuse in giant bonfires, and drinking alcohol. 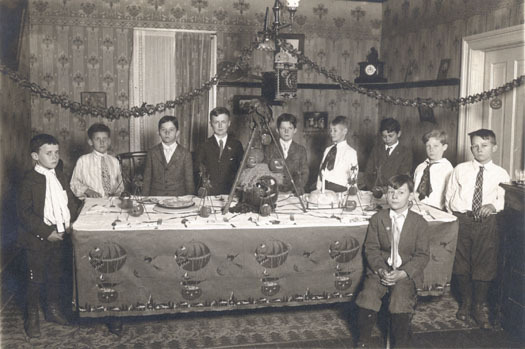 Later on, Middle-class Victorians turned the holiday into a more benign event, with an emphasis on amusing parties for young and old. By the early 1900s, however, things were changing yet again. While the emphasis on children remained, another, earlier tradition had been reinstated by the day’s youth: pranking. 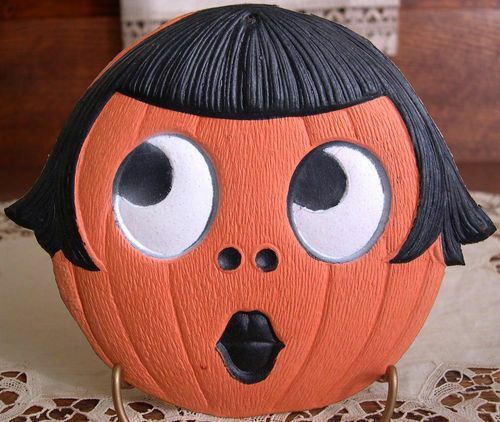 Noisemakers called “tick-tacks” were a popular Halloween item for over 50 years. “Tick-tacks” were notched wooden spools on sticks with winding string around them, with a nail “serving as an axle,” and were often left against house windows. 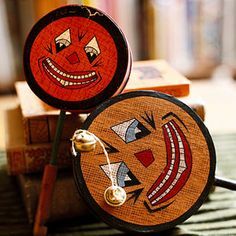 “When the string was pulled, [the notched spool] made a loud and rapid ‘tick-tack’ noise” against the glass.12 It was a harmless way of frightening the occupants. Virtually all of these fires, property damage, and deaths could be attributed directly to the activities of “unruly youth”—and many ended up arrested for their troubles. 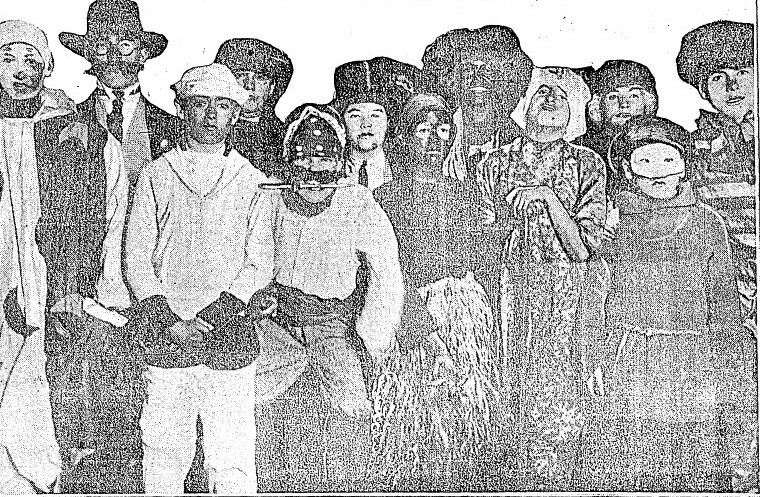 On Halloween 1923, even “staid Evanston” got in on the action: “…the police station was packed with boys arrested and held until their parents came to take them home. More than 200 boys were taken into custody in Evanston, Wilmette, Winnetka, and other north shore suburbs.”16 In Chicago that same year, “more than a dozen boys were arrested…for breaking street lamps…firemen and police were kept busy turning off fire hydrants and pursuing gangs of boys who went around letting the wind out of automobile tires.”17 Sometimes, though, those they vandalized fought back: a sixteen year old boy named Ray Nelson ended up with a fractured skull and in critical condition thanks to an old man named James Dragon. Nelson was busy “tearing down Dragon’s picket fence” with some other boys when Dragon came out and “struck [Nelson] down with one of the pickets.”18 Ultimately, however, the possibility of being caught, “taught a lesson” by angry adults or getting arrested didn’t deter too many kids from their fun, and the vandalism continued. By October 1926, Chicago’s adult population had had enough. While many adults felt that small pranks were fine, the rising tide of vandalism and violence within the city was unacceptable. So, they decided to put a stop to it—by appealing directly to the children responsible. Using a combination of bribery, lectures, and other entertainments—plus an emphasis on, of all things, civic pride—adults attempted to persuade kids to stop the violence on their own. Reasoning that he could appeal to “the children’s pride in being useful members of the community,” William McAndrews, the superintendent of Chicago schools in 1926, issued a bulletin that asked children to refrain from destructive pranking.22 While he admitted that “there is much of…Halloween that is prankish, good humored, provocative of fun, and sanctified by tradition,” activities like “window smashing, smearing whitewash, throwing soot bags, tearing down fences, and the like are a different matter. They should be stamped out.”23 To encourage this, McAndrews and others put together a massive city-wide event. If a kid filled out a pledge card “vowing most solemnly that he won’t do any of the things…that have given the cops such a runaround every Halloween,” he’d get to see free movies!24Thanks to an agreement among a large group of movie theater owners, “ninety-six neighborhood movie houses, with seats for 100,000 students…agreed to open their doors early” on Halloween.25 While the kids who went were also forced to listen to at least one lecture on better behavior (bummer), those who stayed were also allowed to see “special pictures” for free, such as Douglas Fairbanks in “The Black Pirate” or Richard Dix in “The Quarter Back.”26 Other organizations got in on the act, too, with Boy Scout groups and the YMCA offering alternatives to roaming the streets unsupervised. Schools did their bit as well, creating large events that featured parties, parades, costumes, carnivals and contests to keep children busy. Parents got involved in other ways. Not only did the city encourage them to “extract a pledge from them that they will attend one of the parties arranged by the board of education or the park boards, and that they will refrain from vandalism,” but they provided their own fun, too.27 Many parents offered house parties for children in the neighborhood to discourage vandalism. They often used new holiday booklets, like the Bogie Books of the 1920s and 30s (you can read one from 1920 here), to organize festive parties. According to Morton, “These books were popular from about 1915 until 1950…and included poetry recitations, one-act plays, pageant suggestions and other theatrical performances that would presumably occupy young minds…and…keep them from contemplating pranking.”28 A typical children’s party might feature apple-bobbing, fortune-telling games, spooky stories, bonfires, parades, an old Irish game called snap-apple (kind of like bobbing for apples, but without the water), and special foods like donuts, fortune cakes and cider. Some party tables might even feature bowls of candy corn, a festive Halloween treat that was first mass-produced in the 1920s.29 Early Halloween costumes were “simple homemade affairs” which “often utilized the image of the outsider: costumes for gypsies, hobos, bandits and pirates were all easy to produce, requiring little more than old castoff clothing and a few accessories.”30 Kids could show up to a house party, have some good, clean fun, and not wreck anything. Liked that Saturday Evening Post cover? Check out more Halloween ones here. 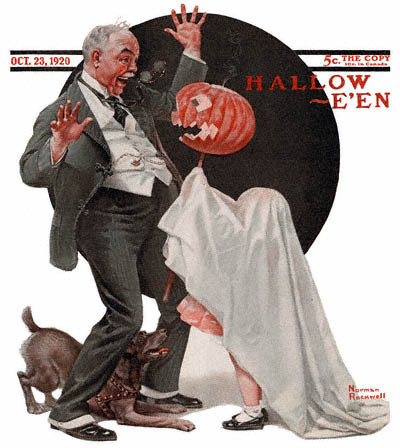 Want to learn about the history of Halloween, vintage style? 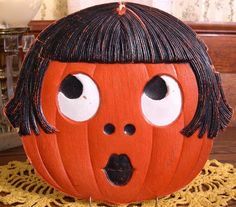 Back in 1919, a 26-year-old American librarian made history by writing the first real historical treatment of Halloween. Produced by a publishing company with a serious interest in folklore, it’s a classic. You can read the entire thing for free here at Project Gutenberg. Want a bit more naughty kind of fun? 😉 Try these vintage 1930s Halloween pin-ups, which helped to cement Halloween imagery in popular culture. “BOY SCOUTS KEEP ALL-HALLOWS.” Chicago Daily Tribune (1872-1922), Nov 01, 1921. http://search.proquest.com/docview/174887224?accountid=3688. “1 DEAD, SEVERAL HURT, BY PRANKS OF HALLOWEEN.” Chicago Daily Tribune (1872-1922), Nov 01, 1922. http://search.proquest.com/docview/175043807?accountid=3688. “‘TWAS A WILD NIGHT FOR COPS AND FIREMEN.” Chicago Daily Tribune (1923-1963), Nov 01, 1924. http://search.proquest.com/docview/180569726?accountid=3688. “BANE HALLOWEEN SKIDS AS PRANKS PILE UP DAMAGE.” Chicago Daily Tribune (1923-1963), Nov 01, 1923. http://search.proquest.com/docview/180525809?accountid=3688. “HALLOWEEN FIRES COST ONE LIFE, FRIGHTEN MANY.” Chicago Daily Tribune (1923-1963), Oct 31, 1926. http://search.proquest.com/docview/180841524?accountid=3688. Excerpt is found in Lisa Morton’s Trick or Treat: A History of Halloween (Reaktion Books Ltd, 2012). P 73. Morton, Lisa. Trick or Treat: A History of Halloween (Reaktion Books Ltd, 2012). P 75-76. “SEIZE 7 BOYS FOR HALLOWEEN DEATH OF 2 COPS.” Chicago Daily Tribune (1923-1963), Nov 02, 1924. http://search.proquest.com/docview/180611416?accountid=3688. “BULLETS QUELL HALLOWEEN RIOT AT PARK DANCE.” Chicago Daily Tribune (1923-1963), Nov 01, 1925. http://search.proquest.com/docview/180722689?accountid=3688. “FOR A WELL-MANNERED HALLOWEEN.” Chicago Daily Tribune (1923-1963), Oct 11, 1925. http://search.proquest.com/docview/180678042?accountid=3688. “SAFE AND SANE HAILED AS MAGIC FOR HALLOWEEN.” Chicago Daily Tribune (1923-1963), Oct 26, 1926. http://search.proquest.com/docview/180773035?accountid=3688. “PLANS COMPLETE TO CUT PRANKS ON HALLOWEEN.” Chicago Daily Tribune (1923-1963), Oct 21, 1926. http://search.proquest.com/docview/180753285?accountid=3688. 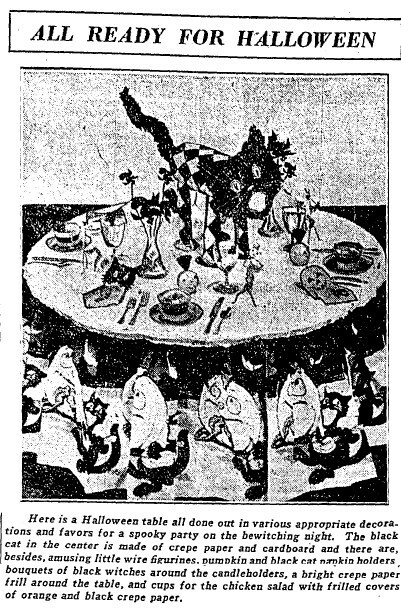 “North Siders’ Parties Rout Spook Pranks.” Chicago Daily Tribune (1923-1963), Nov 04, 1928. http://search.proquest.com/docview/181009046?accountid=3688. This entry was posted in holiday post and tagged 1920s Halloween, Chicago Halloween 1920s. Bookmark the permalink. Never imagine Halloween was such a dangerous affer in Chicago in the 1920s. Thank you for this great post! I, too, am writing a story, in which one of the characters reflects on his boyhood in 1920s Chicago. Though I knew about the window soaping from my father (born 1916), I’d not heard about the more destructive pranks! But considering he ran with a gang in Bucktown, I’m sure he got up to lots of mischief he never told his daughter about!